How time flies! We are all moved into our spacious new store in Saint Joseph Michigan As we started to move and then as I attended the closing of the building we resided in for almost 13 years, it caused me a great deal of reflection. I do have to say that along with that, there was anxiety and fear while at the same time I experienced the joy of the "bigger and new" looking forward. My mother, Loretta Benedict, Nurse, started Accomplish Quilting in the basement of my parent’s home in Pennsylvania in 1993. Mom’s objective was simple, “Help people accomplish the objective of finishing their quilts. After Clarence retired he decided to help expand Mom’s business by selling the machine she quilted with. ​In order to obtain longarm dealership status with a defined territory, Clarence and Loretta had to move to Michigan in 2001. We worked out of the basement and garage of my parent’s home. At that point, I joined my parent’s business working nights and weekends all while holding down a full time position at American Electric Cook Nuclear Power Plant. Quite a few more nights than my bosses would care to know, I only slept a few hours. ​In 2003 we decided to expand and purchased our building in Stevensville. For the next 12 years, we struggled with ideas for growth that couldn’t be accomplished because our building was too small. When we were moving, I just could not get over how much we had crammed into that little building and the warehouse behind my own house! We purchased our new building in January of this year. Dad, Clarence, took this building on as a major project, much like when he was the plant manager for Roger Penske’s Truck Light Plants back in PA. My dad led this huge undertaking each and every day since January, while I was at the Stevensville store, traveling to trade shows, and taking care of business on a daily basis. Dad put in very long hard hours. We can never thank him enough for his dedication, care and work that he contributed. It truly was a gift. We had such humble “American Story” beginnings with my parents starting this business. In 2005, I joined the business full time and bought the business after my parents retired from their second careers here at AQ. There is no such word as retirement for my Dad though. When he is not working at his small farm in Pennsylvania, he works with me in the business as CFO. This is his retirement hobby! As I closed on the old building, I looked across the table at the younger man who was just about the same age as I was when starting the Stevensville store and realized that the torch is being passed on in a way. He owns a store about a half a block away from the Stevensville store and by purchasing my building, this was his next step for growth as it was mine those 13 years ago. He is working towards his hopes and dreams for his business and family much as I did back in 2003. Today, with 15 employees, a big “new” store and great customers - many are now friends, I look with optimism once again to our future. It is exciting! It is because of all of our wonderful customers that we are able to grow, employ a number of people and do our own part to add to the economy and create our Own American Dream. 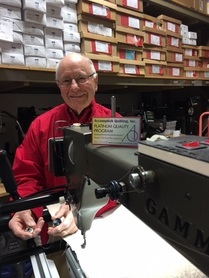 Heart-felt thanks to my father, thanks to our employees for their support and work to help make this happen, thanks to Neal Swartzberger for our strong relationship with ABM/Innova and very special thanks to each and every one of you who spend your hard-earned dollars at Accomplish Quilting in pursuit of your dreams.